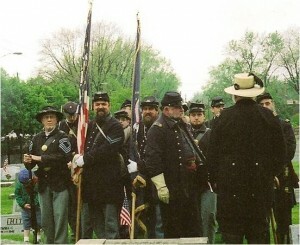 On a very rainy Saturday morning, May 31, 2003 in a far corner of the old Willoughby Cemetery, just a few blocks from downtown, two buglers played the haunting and melodic music of “Taps”. 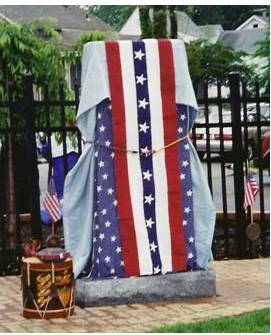 Across the way, near the main gates of the cemetery, approximately two hundred people listened and witnessed the dedication of a beautiful, gray, granite Civil War memorial. Engraved on the memorial were the names and regiments of ninety-five Civil War veterans buried there. This dedication ceremony was the culmination of the efforts of the Northeast Ohio Civil War Round Table (NEOCWRT) and, especially, its Legacy Project Committee. Their work began more than three years earlier. “On January 27, 2000, Founder Joe Tirpak formed a Legacy committee and called a breakfast meeting at Bob Evans in Willoughby. Committee members who attended this initial meeting were Jim Walsh, Ted Karle, Franco Sperrazzo, Brent Morgan and myself. Joe wanted the NEOCWRT to be more than just a group of men that met once a month, had a couple of drinks, ate dinner, listened to a speaker and went home. We brainstormed for ideas. 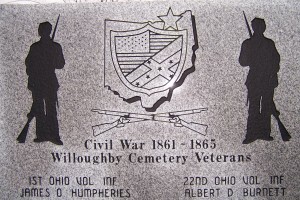 I happen to like visiting old cemeteries and mentioned that there were a number of Civil War headstones at the Willoughby Cemetery. I had noted that some of the headstones were badly weathered and that the names were nearly unreadable. I felt that it would be shameful if the names of these brave men were forever lost because of neglect or indifference. 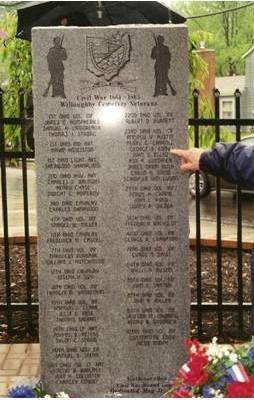 A number of Legacy Committee members visited the Lake County Historical Society, contacted other Civil War enthusiasts, and traveled to Mercer County, Pennsylvania to view a commemorative plaque. 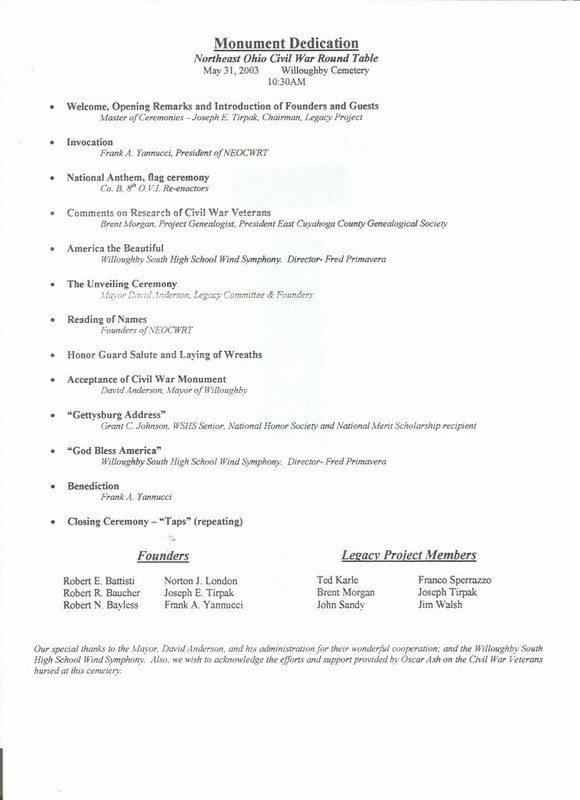 On the committee’s third meeting, John Sandy presented a list of Civil War veteran burials at Willoughby Cemetery. By the meeting’s end, the committee agreed to recommend that the board purchase and donate a brass plaque commemorating the Civil War veterans interred there. They believed that this process could be repeated annually at other cemeteries throughout Lake County. They were to discover, however, that placing even a single marker would prove to be a challenging undertaking. With board approval, the committee turned its attention to project implementation. There were two primary concerns. The first dealt with the plaque and/or boulder: finding a supplier; raising funds to cover costs; obtaining authorization; selecting a site for placement; and dedicating the memorial. The second concern involved determining the names and regiments to be inscribed. Committee member Ted Karle took the lead in locating suppliers for the plaque and boulder. Not surprisingly, cost quotations were higher than originally anticipated. 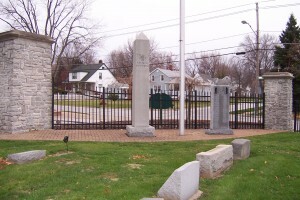 After considering a number of possibilities, the committee decided upon the Willoughby Cemetery as the most appropriate site for the memorial. The group worked with the city of Willoughby and Mayor David Anderson for authorization and cemetery site selection. The city suggested and the NEOCWRT agreed upon a location near the cemetery’s Sharp Road entrance. The task of identifying the names and regiments to be inscribed on the plaque proved to be an even more daunting task. 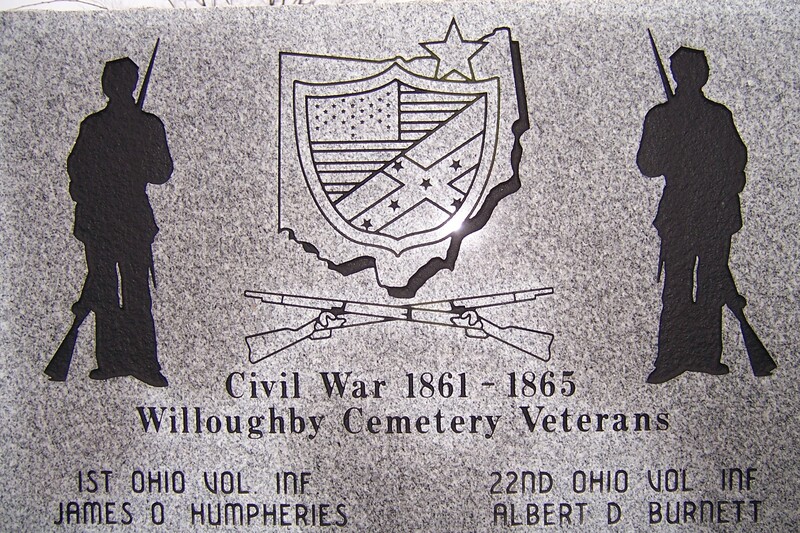 Earlier, the committee had met with Oscar Ash a local historian and genealogist, who had previously compiled a list of one hundred fourteen Civil War veterans he believed to be buried in the Willoughby Cemetery. Brent had compiled his own list based on an 1895 veterans census. Brent and other committee members visited the Willoughby Public Library (home of the Willoughby Historical Society), Painesville’s Morley Library, the Lake County Historical Society, the Lake County Recorder’s Office, and the Western Reserve Historical Society as part of their research efforts. The Recorder’s Office was particularly helpful in verifying those who were service veterans, and between seventy and eighty percent of the names on Oscar Ash’s original list were confirmed. Brent continued to work with Ash but was unable to verify the service and/or regiments of a number of names on their lists. Brent, accompanied by Ted Karle, expanded his investigative travels to include a visit to Columbus’ Ohio Historical Society and three visits to the National Archives and Records Administration in Washington, D.C. The initial target date for dedication, Memorial Day, 2002, came and went. In September, 2002, four or five names remained unverified. Brent Morgan could not make another trip to the National Archives, so it became desirable to hire a researcher to perform those final checks. 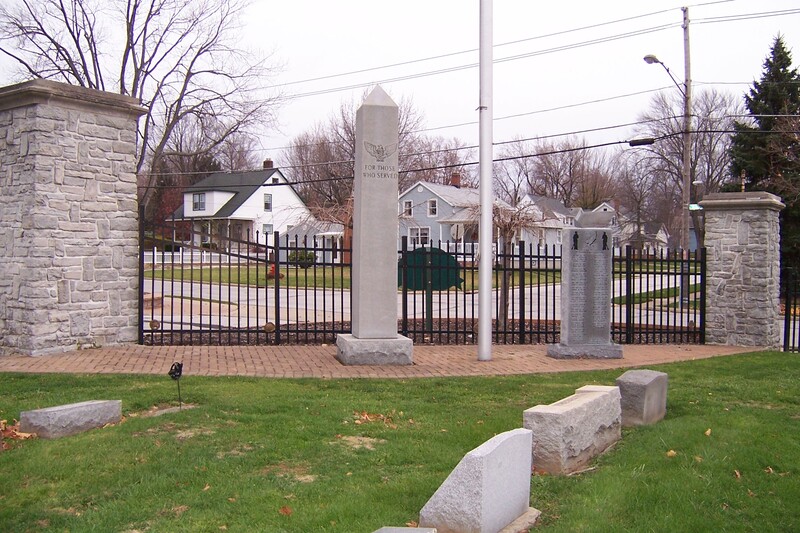 By April, 2003, Ms. Melchiori completed her research, and Brent was satisfied that he now possessed an accurate list of ninety-five Civil War veterans buried in the Willoughby Cemetery. Meanwhile, in February of 2003, Ted Karle reported the bids for the plaque, including one from Northcoast Memorials that included a polished gray granite monument. Committee consensus was that a granite monument would not only be pleasing, more formal, and appropriate, but that it would allow for adding names should it become necessary. The committee very much liked the idea of a granite monument even though it would entail added expense, and the NEOCWRT Board of Directors approved the additional funding. Ted Karle subsequently designed the memorial with a soldier and cannon carving in conjunction with the NEOCWRT logo. 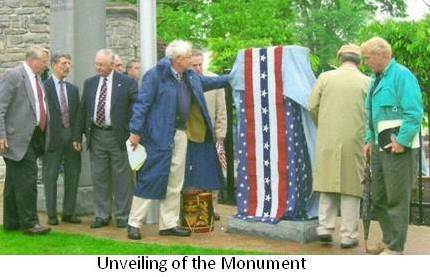 With its two major tasks completed, the dedication date was set for Saturday, May 31, 2003. As with any event, there was more to do and more details to be attended to than anticipated. Yet, the committee handled it well — from the chairs donated for use by Mitch Babcock of the Davis Funeral Home, the invitations sent to community dignitaries, to the notices in local newspapers announcing the upcoming event. The dedication went well; only the weather was uncooperative. Joe Tirpak made arrangements to use the Historical Society’s Lake County Bicentennial Bell in the dedication ceremony. Kathy Purnmal, Lake County Historical Society Executive Director, assisted by her husband, personally delivered the bell. 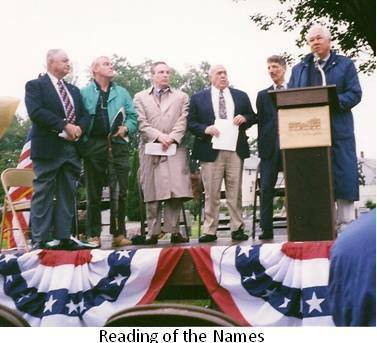 The honored veterans’ names were read by each of the six founders of NEOCWRT (Robert E. Battisti, Robert Baucher, Robert Bayless, Norton London, Frank Yannucci, and Joe Tirpak). “I contacted a drummer and re-enactor from the professional Camp Chase Band who attended with the group from the 8th Ohio. Joe Tirpak, dedication emcee, later received e-mails from several attendees commending him and the Legacy Project Committee for their work. One attendee even returned to the cemetery with his father the following day and described the ceremony to him in an effort to re-live the moment. Our beloved founder, Dr. Battisti died the following winter on February 13, 2004. The members of the NEOCWRT wish to express their gratitude and appreciation to the many people, organizations, and businesses whose contributions and support helped make this dream a reality. Below is an image of the program that each attendee received.